Asiatic wins a $1million-project to supply and install a BIPV (Building Integrated Photovoltaic) solar system to the Visitor Centre and Breeze Shelters of the iconic Waterfront Promenade project. The total output from this solar system is 43.9 kWp. The $35 million waterfront promenade is designed by an international design team led by Australian architects, The Cox Group, in collaboration with local firm Architects 61 and Arup engineers. Its key design features a continuous waterfront loop, and along the Bayfront, visitors can expect to see dancing water jets, a Mist Walk, the Double Helix Bridge, and an eco-friendly Visitor Centre. When completed, the 3.5 km waterfront promenade will form part of the longer 11.7km waterfront route around Marina Reservoir, which will link up the Gardens by the Bay, the Marina Barrage and the new Sports Hub. 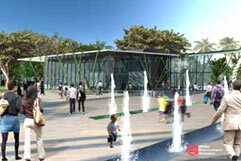 The 'Visitor Centre', adjacent to the linear water features, provides information, house exhibition and ticketing facilities and a small café. As part of the efforts to make Marina Bay an eco-friendly district, the Visitor Centre will also include sustainable design features, such as natural ventilation, natural day-lighting and solar roof panels. The stretch of the waterfront promenade along Marina Boulevard will be a shaded tropical walk with flowering shrubs and shade trees to create a lush and delightful experience. It will include three 'Breeze Shelters' - pavilions with large solar-powered fans - which will provide a cool and breezy 'pause point' for visitors to rest. Asiatic is contracted to supply and install the solar glass roofs of the eco-friendly Visitor Centre (32 kWp) and the three Breeze Shelters (11.9 kWp).